We all know these athletes love to make a statement before & after the game as well as certain events when it comes to their choice of outfits. I get it, making a fashion statement is a big thing for these fellas, but fashion and flat out repelling are two completely different things. Oh Westbrook. I think all those little people don't even want to be seen on that shirt. It appears as if they are literally trying to run away. I love me some Wade but I can't quite figure out if I like or just flat out hate this jacket. Capri's are a no-no for you Wade. Durant wearing what appears to be a vomit colored shirt covered up by a no shape army green jacket. Paul George (recently actually) damn sure made my list. WTF is this? Just reminds me of the bad part of the 70's. Harden, last season. Reminds me of a filet of Salmon with a side of beard. I can't begin to express how smitten I get when I see Dwyane Wade and LeBron James show the world how close they are on and off the court. Non-Miami Heat fans will take any opportunity to act or speak negatively about them, even when they are being genuine about each other in the media. After last night's Game 5 win against the Chicago Bulls, which advanced the Miami Heat to the Eastern Conference Finals, LeBron had a lot of things to say in Dwyane Wade's defense at the post game press conference: "He's a Hall of Famer, he has two rings, he doesn't have to prove himself to anyone, no one," along with "I really don't care for the trash talk he receives." These two stick up for each other more so than any teammates in the NBA. Which brings me to this: Rumors are swirling that LeBron will leave Miami once Wade does, but I have to respectfully disagree. Remember when Wade was alone on the Heat after the first championship? He was a tremendous player on a team that lacked the talent and strength to make it a second time. Wade became a free agent in 2010 and Pat Riley (the mastermind himself) knew he couldn't lose the star of the team. Instead, he brought his star some serious talent and helped start an incredible dynasty. The fact that Pat Riley made it possible for his star to be satisfied then and get him the proper tools says A LOT about how he runs things. Wade has unselfishly handed the 'torch' to LeBron and that is also a huge part of why I don't think LeBron will be leaving Miami. All of us Heat fans know that the blood, sweat, and tears are that of Dwyane Wade's; the way he willingly stepped down to let LeBron shine shows the utmost respect he has for him and a willingness to make the team stronger. Once Wade eventually makes the decision to retire (may I add a sad day that will be), it will technically be LeBron's team and Pat Riley will make sure to keep him happy just like he did with Wade. Mark my words! Not to mention, Wade and LeBron are such close friends that I'm sure they will want to remain close on a personal level. I mean come on, Wade can be the new Alonzo Mourning sitting behind the bench at home games cheering them on (well, that's my vision at least)! They are brothers, and with Pat Riley behind the scenes I think LeBron is here to stay for a while. Fun fact: When the Heat won the title in 2012, Dwyane Wade and some others from the team went on a yacht trip and Wade cut the trip short so he could support LeBron in the London Olympics. My sources say that Wade walked into the arena where Team USA was playing, LeBron saw Wade and gave the old 'head-nod' and smiled. LeBron then continued to beast on the court. Miami Heat PG Problem: Why Should LeBron James Have to Guard Nate Robinson? I am still licking my wounds over the Miami Heat's Game 1 loss on Monday. It wasn't the greatest way to start my week. But, if anything, that loss should be huge motivation for the boys. However, that's not the reason for my rant today. I have been listening to sports radio constantly since the Game 1 loss and a big topic that keeps popping up is LeBron James guarding the Chicago Bulls' point guard Nate Robinson during Game 2 tonight (May 8). Lebron was quoted on ESPN saying "It wouldn't be a surprise if I matched up with him, but I'll take the challenge on [defense]." I in no way agree with this decision. What is the point of the Miami Heat having a point guard if they can't use him effectively? Which brings me to Mario Chalmers, our point guard, that I am not the biggest fan of. My biggest problem with Mario or 'Rio,' is that he is not consistent; not to mention he cannot guard his match up, ever. 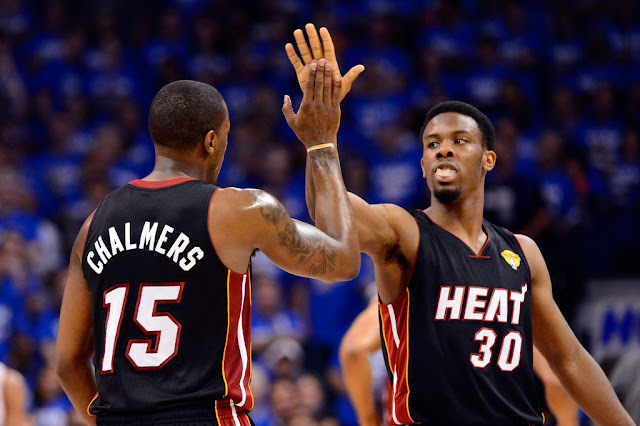 Now, with that said, we have quite the young, fresh, and consistent PG on the bench in Norris Cole, who I am almost positive will start in Mario's place sooner than you think. Norris averages 6 PPG and 3 APG, which in reality, being in the league less than half the time Mario has been, is pretty good. The way Cole moves on the court is incredible. Sure, he's a little sloppy at times and makes a few silly mistakes here and there, but he has leeway being such a newbie. I have seen Cole put in so much effort; in the post, under the rim, going for steals, low foul calls, etc. Don't get me wrong, I love my team and everyone who contributes to it, but I have a real problem when we can't even count on our own PG to defend another team's PG, especially one they match up to! LeBron will take any challenge that is given to him, and do it well. I would have liked to see Dwyane Wade guard Robinson tonight. Maybe his knee is a factor? I just I don't see why LeBron needs to step in when we have someone else who SHOULD be able to handle it. Funny fact: Whenever I say anything negative about Chalmers, he usually turns around, proves me wrong, and shuts me up. I am hoping tonight he can step up and help take some of the load off of the Heat MVP's shoulders. With that being said, Go Heat!!! (I'll be in my living room having a heart attack for the duration of the game). Feel to tweet with me while I do so: @_Cat5.